The 402 is probably the closest thing in existence now to any of the once extensive network of long cross-border routes operated by London Country, surviving more-or-less in its original form, but this is after a gap of a few years. Most routes have been cut back so that they only venture a short distance beyond the border on one side or the other, while the few that do still provide worthwhile cross-border facilities have all been substantially altered in other ways. Although the 402 has had a diversion, this is relatively short compared to the lost sections of the other routes. For many years the route operated only between Bromley and Tonbridge, although the section between Sevenoaks and Tonbridge, shared with routes 403 and 404, was gradually reduced and withdrawn altogether during the 1970s. The 402 also operated direct via Polhill rather than deviating via Halstead and Knockholt Pound as the route does now. The latter points were covered by the 431 group of routes, which ran into Orpington. The route was withdrawn completely in 1980, but at that time there was a parallel Green Line coach service (706), with the 431 covering most local travel requirements and also being diverted via Badgers Mount. The 706, along with the 431, was withdrawn in 1987 when Kentish Bus "modernised" their network. Among the new routes was the 22, following the same route that the 402 does today, and differing from the original 402 by serving Weald and Knockholt Pound. However, the new numbers were not well received by the passengers, so the old numbers were gradually re-instated as the opportunity arose. 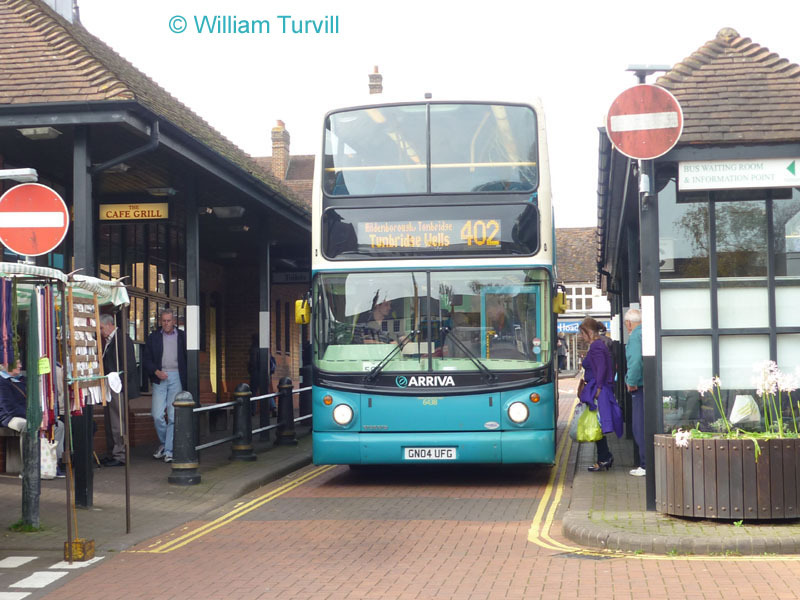 In the case of the 22 this opportunity came in 1990 when the route was, as 402, cut back to Sevenoaks again! However, Tonbridge was reached again in 1992, with an extension all the way to Tunbridge Wells, making the route almost 2 hours end to end. In June 1997 the route was "re-launched" with newer Olympians, and operations were transferred within the newly formed Cowie empire to Maidstone & District’s Tunbridge Wells garage. The evening and Sunday service, which was operated under contract to London Transport and only ran between Pratt’s Bottom and Bromley, remained at the route’s traditional Dunton Green base as the allocation was shared with route 320, although Dunton Green itself closed that November; the evening and Sunday service did not last much longer. The Olympians were painted in a red version of Arriva livery, although in practice these were often substituted with other Tunbridge Wells based vehicles in the standard aquamarine. The red presumably reflected LT pass acceptance at the London end, though this was long before red liveries were as standard as they are now. Later, the Olympians were replaced by DAF double deckers which had been bought new in 1998 by the London & Country part of Arriva for the 85, and latterly operated by London United on sub-contract, after the 85 passed to London General. However, a desire by TfL for low floor operation resulted in some DAF SB220/Plaxton Prestiage single deckers taking over in April 2006, these being painted in national livery of "aquamarine and stone" (that being the official description!). These vehicles had previously been used on routes 480 and 490 between Gravesend and Bluewater/Dartford, and were new in 1999 when the service was beefed up upon the opening of Bluewater. The recent opening of the Kent Fastrack scheme, with more new buses, resulted in them becoming surplus. The DAFs however fell foul of the London Low Emission Zone, which was introduced in July 2008, as they did not have particulate traps, a filter on the exhaust. Some long Darts, which did, were available following contract renewal of route 370, so these were requisitioned for the 402, returning close to their old haunts on route 286! 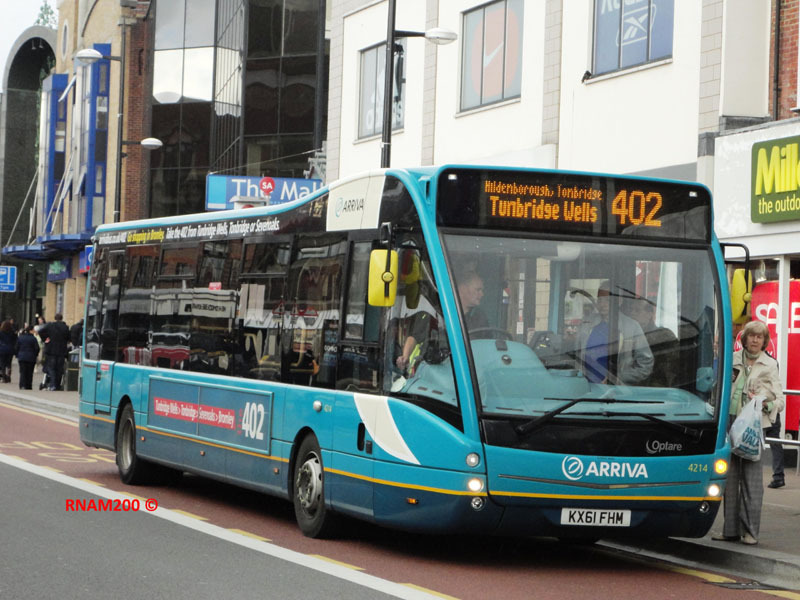 However, Arriva evidently felt that another re-launch was due, and so more new buses arrived during 2011 in the shape of 11.1m length Optare Versas. Two views of the new buses are provided here, the first being at the delightful location of St. Botoph's Road in Sevenoaks (near the station), where 4213 (KX61 FHN) was seen on Friday 20 April 2012. Note the single door layout, which has fallen out of favour with Transport for London, but can still be used by commercial operators. Sister vehicle 4214 (KX61 FHM), meanwhile, is seen back in London territory making a welcome break from the sea of red buses in Bromley town centre on 10 July 2012. Note, in both cases, the modest route branding carried on the sides of the bus – another feature which is not common in London, as TfL do not generally approve of it. 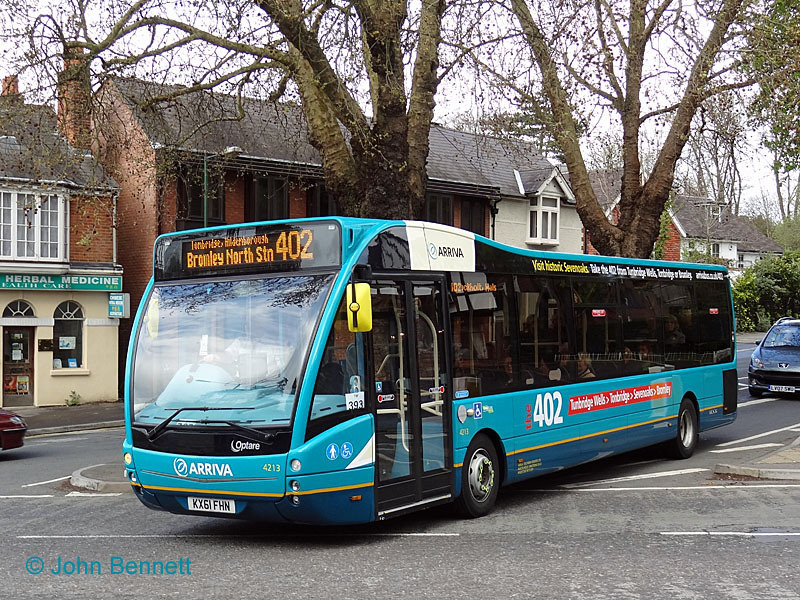 Route branding is notorious for reducing fleet flexibility, but the 402 effectively has a dedicated vehicle allocation anyway, so hopefully instances of these buses straying onto other routes will be rare. Inevitably, other buses do appear from time to time, and I have included this photograph as much because of the location as the bus itself. This is 6438 (GN04UFG), an ALX400 bodied Volvo B7TL, on 3 November 2010 in Sevenoaks bus station. The design of this station is streets away from TfL's clinical affairs. The route never seemed to me a prime candidate for double deck operation anyway – even at the London end most potential passengers are abstracted from single deck route 358, so heavy loadings are not to be expected. The need for double deckers in the past probably arose from the various schools served in the Sevenoaks and Tunbridge Wells areas, although it seems double deckers are no longer deemed necessary even for those flows. The ongoing survival of the route running so far into London is surprising. It was one of the last routes operated on a London Local Service Agreement, whereby TfL compensates the operator for accepting its tickets, but like the other such routes has now been converted to a London Service Permit, though seemingly does still accept most TfL tickets. (LLSAs are still theoretically available, but TfL have made the terms commercially unattractive.) Interestingly, the section through Knockholt Pound, Halstead and Badgers Mount has always accepted London passes, even though it is actually outside Greater London. The London section of the route is covered by TfL routes, so TfL may well not regard it as something warranting support from the London budget even though the 402 does provide unique links.